1000’s of animals 2 by 2? This is another cornerstone aspect of the story and perhaps one of the 2 or 3 most difficult issues to resolve. 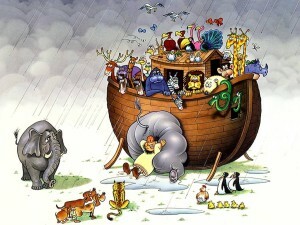 How exactly would Noah fit all the animals we have in the world today on the ark? Regardless the size of the vessel or length of the voyage, this question leads us into some basic math that is absolutely mind boggling. In a web article from August of 2011, Science Daily informs the reader that there are “about 8.7 million (give or take 1.3 million)” species of animals alive and well in our world today. Aside from the 1.3 million headcount variable, the site goes on to acknowledge that less than 1 million of these have actually been described and catalogued (the number provided in the graph is 953,434 to be exact). Out of the 8.7 million proposed species, the site states that approximately 25% of that number would classify as marine or aquatic life. If we were to apply that 75/25 ratio to the actual number of identified species, we’re looking at a little over 715 thousand species of land lovers. If one were to politely ask, we might be granted permission to trim a third of that number off of the headcount and project that the insect kingdom could find a way to survive on its own. I know they do in Florida despite our best efforts to create bug-free zones. That still leaves us with 500 thousand different species of land loving air breathers that need a helping hand. Let’s say that Noah got a special dispensation of cooperation from the animal kingdom by command from on high and everyone lined up for boarding in much the same organized fashion as those seated in zones 2 and 3 do at Gate #B26 when flying out of (Insert name of city or airport here). If those animals were to be loaded over a 7 day period prior to raindrops, Noah would have to load 71 thousand 500 pairs per day. That breaks down to roughly 3,000 pairs per hour, or 50 pairs per minute, or just under 1 pair every second of every minute of every hour of every day for 7 straight days NON-stop. That’s a lot of wear and tear on the entry ramp, not to mention the stress it must have put on the turtles. From this perspective, anyone can see how the whole idea of the story just appears to crumble under the weight of its own claims. In the book, End The Beginning, I spent an entire chapter and more than 50 pages exploring this very question (Chapter 5, pgs 185-238). That being said, I doubt that I’m am going to sufficiently resolve the issue for every reader in a short blog entry. Keeping in mind that it is much easier to doubt and criticize the Biblical account than to believe it and search for reasonable answers to questions, information becomes only as useful as the reader desires it to be. Our real question might actually be: Where did the wide variety of animal life that we experience in today’s world originate? The video above illustrates the proposed history of cats; the same genetic ideas have been applied to various creatures across the animal kingdom, including dogs. The World Canine Organization recognizes 339 individual breeds of dog. American Kennel Club only recognized 167 breeds as of 2010, I’m quite sure they recognize a few more as of this writing. Our world is filled with designer dogs like the Labradoodle, Cockapoo, and the ever-lovable Puggle. My own neighbor owns a dog that is a specific mix of Labrador and Beagle. I’m not sure if it’s a Beagador or a Labble, but it’s world-class odd and 100% healthy. So, let’s rephrase our question. In order for Wendy to have her Chihuahua, Rachel to have her Black Lab, and my neighbor to have his… whatever it actually is, does Noah need to save every Chihuahua, Lab, Beagador or just a sampling of Grey Wolves to serve as generational representative of the species we know today as the subspecies – Canis lupus familiaris? Yes, I know… we’re talking breeds, not species. But my point is that built within the species is an amazing amount of variety and that under the right circumstances, it doesn’t take all that long to bring that variety to the surface. One might argue that this isn’t representative of how evolution works. I would argue that the article clearly states that scientists are studying the amazing variety that we see in dogs so that they might better understand how evolution works. Live Science tied that knot, not me. We could track the same trail of designer breeds through cats, fish, and many other domesticated animals, including varieties of livestock. But still, we’re talking breeds and breeds are not the same as a variation of species… or, are they? The Integrated Taxonomic Information System (ITIS) identifies just a little over 5,300 families of known animals. That number balloons exponentially when we move from the classification of family to the classification of genus. The number explodes again as we move from genus to species. It’s at this point where the count, both actual and projected, moves into the millions. I took the time to work through this in greater detail midway chapter 5. In essence, if we work our way backward through the scientific classification system we move from species to genus to family to order, class, phylum and eventually arrive at the Animal Kingdom. It is at this point where everything is under one generic banner. Your six year old son stands shoulder to wing with a turkey buzzard. True, he probably eats a little more and flies a little less, but under that banner, everyone is on equal ground; we’re all a part of the Animal Kingdom. On the heels of that, here’s a more serious question to ponder: If breeds are variations within a single species, are not species then variations within a single genus? By the same evolutionary principle, would not a genus be nothing more than variations thought to have developed within a single family or individual families be representative of extended variations that developed within a specific order? If all the data that produced our domestic dog variations is present within the DNA of the Canis lupus familiaris, would all of that data, which produced that subspecies, have not also been present within the primary species, and hence the genus? In the grand scheme of things, the question becomes: How far back toward the roots of the original family tree do we need to go to preserve the Basset Hound? It may seem as if I’m splitting hairs here, but a pair of justifiable questions remain on the table with regard to pairs. Question 1: Is a single male/female set of anything sufficient fodder to preserve a nearly extinct animal group? Question 2: What’s the deal with the clean vs. unclean animal designation and how do we tell the difference? Both of these questions affect our overall headcount. We’re plainly told that there were 8 human beings onboard the ark. And, we’re informed that of the 4 mating pairs, only 3 of them produced offspring in the new world. When it comes to the animals however, we’re given some fuzzy parameters to sort through. I’ll cobble together some food for thought regarding the clean vs. unclean discussion in a separate post, as it’s a more lengthy issue. Let’s deal with what the text actually says about the headcount here and now, though. This one seems pretty easy to clear up (or not). We naturally read the initial portion of the verse and have a mathematical paradox for the brain to solve. For most of us, the brain does this on autopilot without is giving it much thought. We recognize 7 as an odd number that doesn’t translate evenly to the male/female set designation. Hence, our brain interprets the meaning to be 7 male/female pairs, or a total of 14 animals. This seems to be logical, given the designation of pairs. Some have argued that a more sensible rendering would be 1 male and 6 females, yielding a total of 7 animals. After all, this is how most farmers would do it; you don’t need a bull for each cow if you want a full squadron of calves in the spring. One healthy bull will suffice. The inclusion of “pair” seems to be the defining sticking point here. Obviously a collection of 7, as opposed to a cluster of 14, would be much easier to care for and feed over the long haul, but “pair” pushes the argument towards a total of 14. For those of you who prefer messy and confusing, the wording of verse two in the Septuagint (LXX) makes things even more fun, “And of the clean cattle, take into thee sevens, male and female, and of the unclean cattle pairs male and female.” Yep… that clears that right up. If we interpret the initial phrase to indicate 7 pairs of animals, then why would we deviate from that principle in the second half of the verse? Should we not read the phrasing to indicate 2 pairs as oppose to a single male/female couple? Two males and two females gives us a total of 4 of each kind of animal from the unclean classification. All in all, it’s my thought that Noah may have saved fewer “kinds” of animals than we’d commonly imagine, while at the same time preserving each individual “kind” in greater numbers than we typically estimate. Let’s take a quick look at how this affects the gangplank math. If we’re looking at less variety, we’ll back up to the scientific definition of Animal Family designations, just for the sake of illustration. ITIS dot-gov identifies 5,300 families of animals. Some of these families are aquatic and some are insects. We don’t need either, but even though inflated, I want to stick with the number. With that number in mind, Noah would have to load 4,921 animals per day, or 205 animals per hour, or 3½ animals per minute, or approximately 1 animal every 20 seconds or so. This is assuming that animals loaded single file, in an orderly fashion and that every bird walked the ramp and got its boarding pass validated on the way through. If the artists that depict such scenes in children’s books are correct and the animals filed up the ramp two by two, you could immediately cut those numbers down to reflect the change of progression. Now, Noah only needs to push a pair through the doorway every 40 seconds or so and we could accomplish the same task in a mere 3½ days, as opposed to 7. This keeps our no-fly zone in place and requires every duck to waddle up the gangplank one step at a time. When you begin to consider the task at hand within these parameters, the task (although still monumental) seems much more feasible, even for an old man who’s trying to sort through the logistics for the very first time.